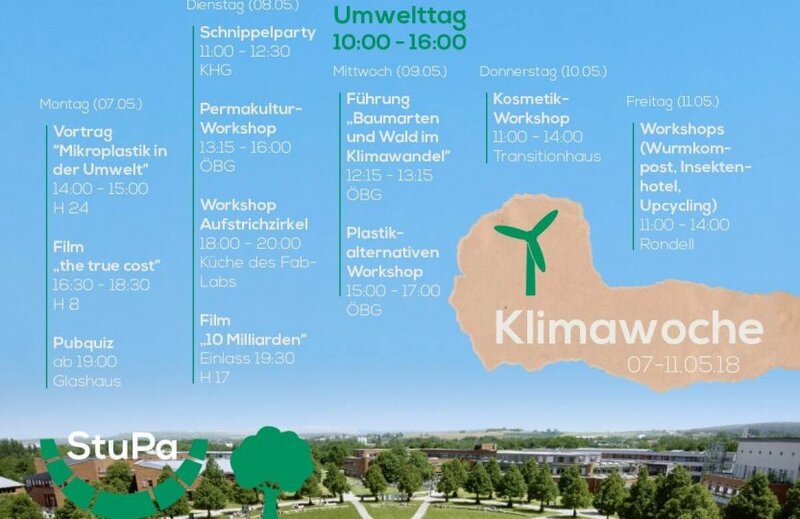 It’s climate week on the Bayreuth University campus! There will be different activities all related to climate and environment in the next days. If you are interested in making a difference, how to contribute to a better world or just in the topic in general, you should better not miss this opportunity. 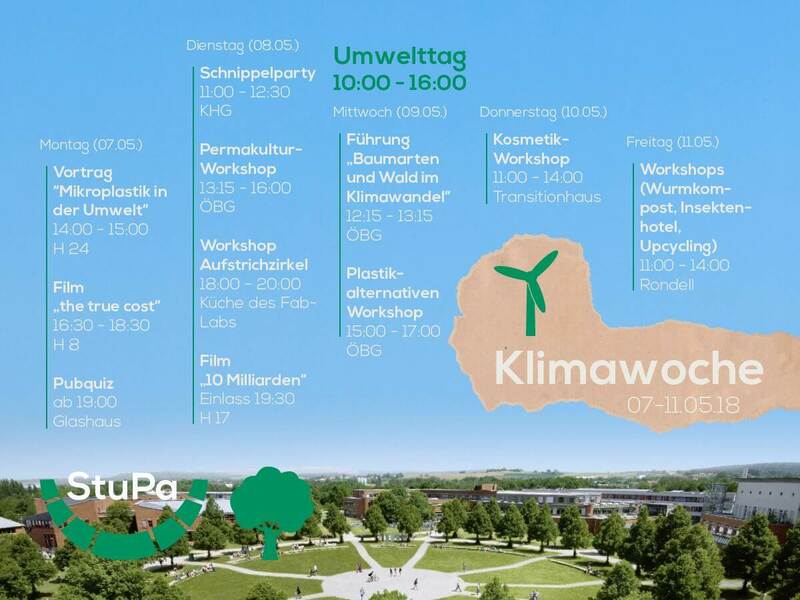 For more information, go to the Facebook page Klimawoche – Uni Bayreuth. Tonight – Monday, 7th May, there is a pub quiz at 7pm in Glashaus. Go and check your knowledge! You can take part in four different activities: At 11pm you can join the “Cutting Party”, where veggies, fruits and other groceries that would otherwise be thrown away, are cut and thrown into a pot to prepare a tasty lunch. (Food)Sharing is caring! From 1.15-16pm, there is a workshop in the botanical garden dealing with the topic of perma culture. In the kitchen of the Fab Lab you can learn how to prepare different kinds of spreads from 6-8pm – make your breads more tasty and diverse in the next time! At 7.30pm, there will be shown the movie “10 billion” in H17. It deals with the problems of a growing population that needs to be fed. From 12.15 – 1.15pm, you can take part in a guided tour through the botanical garden. You will have the chance to learn about how tree species and forests react to climate change. Also in the botanical garden, there is a workshop about alternatives to plastic from 3-5pm. Come and learn! From 11am – 2pm, a workshop in Transitionhaus will teach you how to prepare your own cosmetics. Starting at 11am, you will have the chance to take part in different workshops such as worm compost, upcycling and building insect hotels. These workshops will end at around 2pm. Next PostMake palm oil small again!